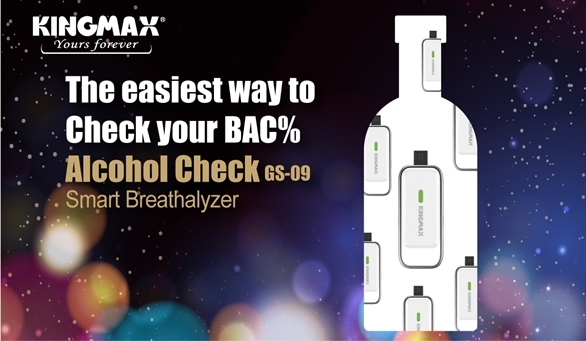 The KINGMAX Alcohol Check Smart Breathalyzer is the world’s smallest alcohol detection device, measuring only32 mmin length,11.5 mmin width. It supports Android 6.0 and is downward compatible with 5.0 / 4.0. No charging required. Plug-and-probe. Fits in any wallet and can be attached to a key ring. When you’re about ready to go home after your meal, simply take out your Alcohol Check, breathe into it for 10 seconds, and your blood’s alcohol concentration will be displayed immediately. An easy way to self-test the alcohol percentage in your blood anytime, anywhere, and avoid drinking too much! Not sure if you’ve had one too many to drive safely? Use Alcohol Check to check it!